Discover the best places to go, what to do and where to dine whilst in Keswick. Keswick is a traditional Lakeland market town situated alongside Derwentwater. WALK: You can choose from a number of great walks in Keswick, however, we’d recommend Derwentwater via Wella Crag. This walk provides stunning views across the lake from the shoreline and a spectacular summit. We would advise adding a mile onto this walk and venturing onto Surprise View – you won’t be disappointed! 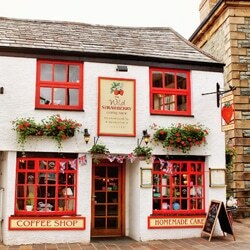 CAFE: The Wild Strawberry is arguably one of the most picturesque buildings in Keswick town centre! It serves a selection of freshly baked cakes and lunches as well as indulgent hot chocolates and coffees, the perfect stop off whilst browsing the shops. Merienda is both a cafe and restaurant famed for its interesting menu packed with seasonal ingredients, we’d recommend stopping by for brunch! MUST SEE: Castlerigg Stone Circle is composed of 38 free standing stones located on perhaps the most atmospheric sites of all British stone circles. It commands a 360 degree view over the surrounding fells including Helvellyn, Skiddaw and High Seat. BAR/ PUB: The Dog & Gun is a traditional quaint pub with timber ceilings and flag stone floor. Serving a fantastic selection of cask ales and delicious pub food, The Dog & Gun is a welcome retreat after a long day walking in the Lakes. SHOP: The famous Keswick Market is held every Thursday and Sunday with over 60 traders offering local produce, art and crafts as well as a selection of celebrated hot and cold foods.